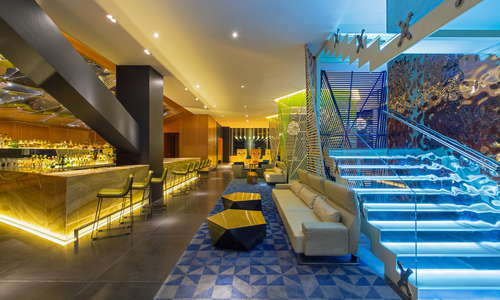 The first W hotel in Latin America grooves with bright colors, clever lighting, and a lobby that brings to mind a cool 1960s airport lounge. It manages to be informal and chic at the same time, with the staff clad in casual black rather than the usual stiff uniforms. Guest-room design is inspired by Mexican culture, including wall-size, fashion-magazine-style photos of models dressed as Aztec goddesses and lucha libre wrestlers, and infinity mirrors that reveal an art installation of fancifully carved, colorful, fantastical Oaxacan alebrije animal sculptures when LED lights are switched on. Modern conveniences are thoughtfully worked into the rooms, which feature plenty of well-placed power outlets (including built-in adapters for European plugs). The Away Spa and Fitness Center has a huge pre-Hispanic temazcal (adobe-domed sweat lodge). Rooms are spacious and aggressively modern, but cozy thanks to the signature W bed and pillow menu. The rooms open to the bathrooms (separated by a curtain) which is where the only windows are; though counterintuitive, it allows plenty of natural light during the day, and isolates the city lights and noise at night. YOU SHOULD KNOW Be sure wifi is included in your room rate, or you will be charged for it. Bathrooms are a focal point here, adding a playful and almost-exhibitionistic feel. Bliss products are a generous touch. And shy guests, don't worry: Those large bathroom windows are one-way only. 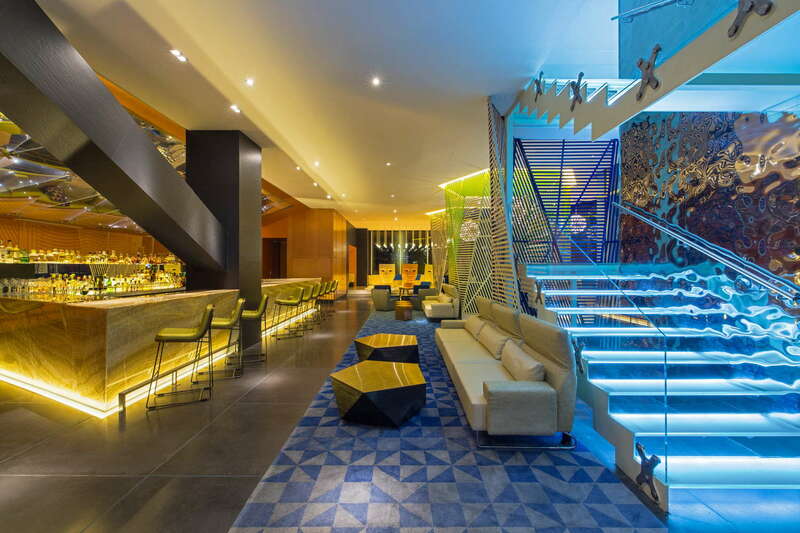 Anchored by the Living Room Bar, your first introduction to the hotel is more nightclub than hotel lobby, with great people-watching of well-heeled international tourists (and the attractive staff). The hotel's concierges are among the city's best connected; don't hesitate to use them for difficult restaurants reservations or complicated needs. 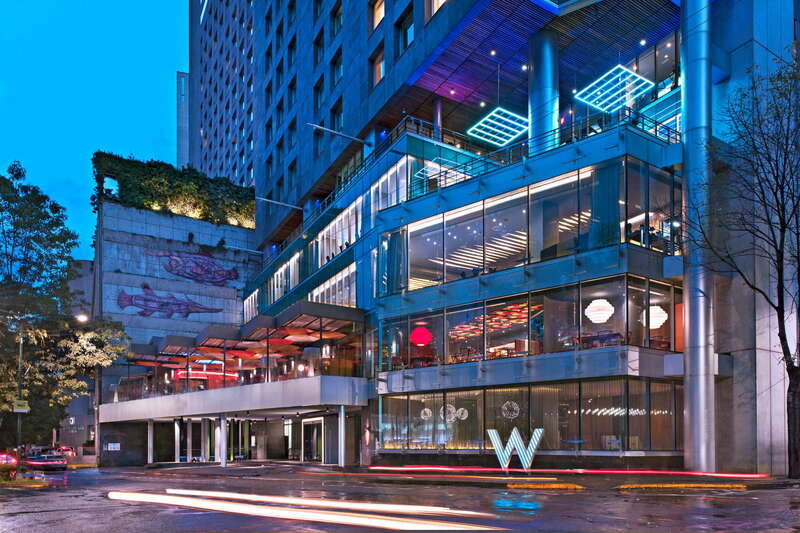 With treetop views of the Polanco neighborhood, the hotel's Away Spa is popular with hotel guests and locals alike. It's the rare in-city spa with a temazcal, the indigenous adobe sweat lodge. There is also a juice bar, sauna, and steam room. There's no swimming pool but there is a large whirlpool. The gym is located within the Away Spa, with up-to-date equipment and towel service. 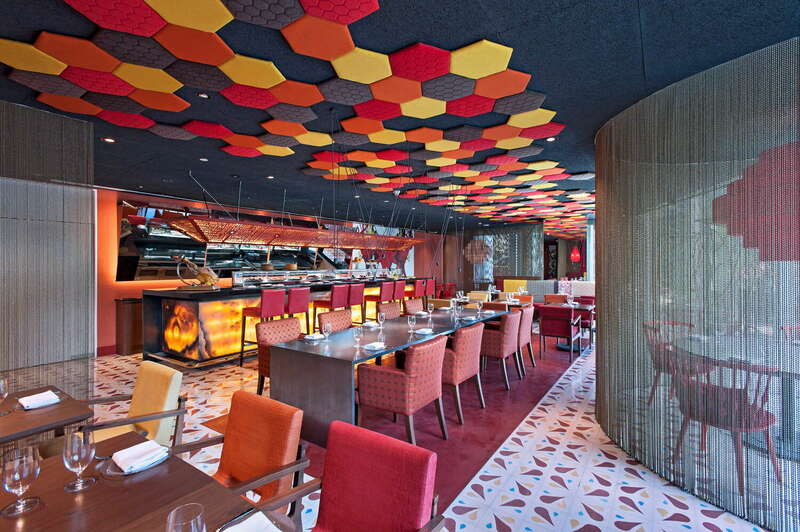 J by José Andrés is the famed Spanish chef's first restaurant outside the U.S. and Puerto Rico. 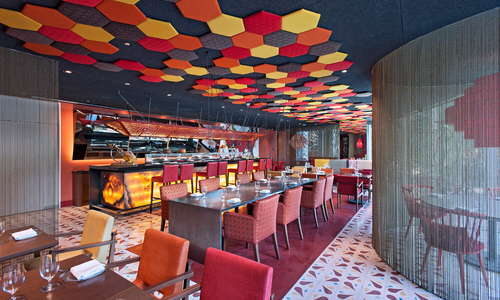 It offers his playful Spanish cuisine with some Mexican touches—and much gentler prices than his Stateside equivalents. 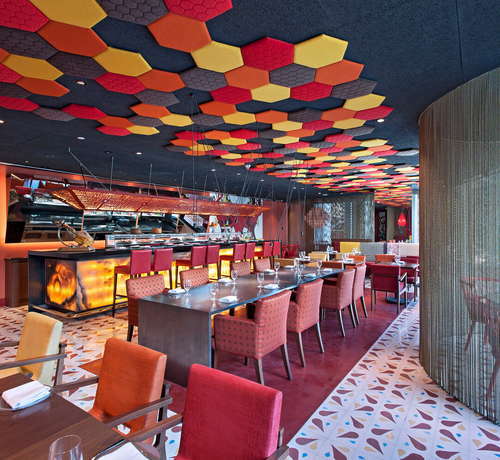 Try one of his famous paellas, the egg "taco" with jamón Ibérico, quail egg, and caviar, or the arroz con pato, a fancified duck rice with duck confit, cured duck breast, and duck foie gras. There's also an extensive selection of Spanish and Mexican wines. The Living Room Bar in the lobby strives for a party atmosphere at night which may not be to everyone's tastes, but it's always a great place for one of their signature cocktails in the late afternoon or early evening. It's easy to explore the Polanco neighborhood on foot. The hotel is located on one of Polanco's main streets, Campos Elíseos (Spanish for Champs-Elysées) and a short walk from the other main drag, Avenida Masaryk. Though near Chapultepec Park, note that the park is huge, so some destinations within it might be a longer walk then they appear on a map. Popular with businessmen during the week and Mexican families on weekends, the Polanco location of El Bajio (2-minute walk) serves textbook versions of the panoply of Mexican cuisine. Belmondo (9-minute walk) is a chic spot for salads and sandwiches made with local ingredients. Pujol (10-minute walk) is perhaps the most famous restaurant in the city, and often touted as one of Latin America's best. Limantour (7-minute walk) was a pioneer in the city's mixology scene, and offers creative cocktails made with Mexican ingredients. Though a great margarita is surprisingly hard to find in Mexico City (it's not a common drink among locals), you'll find one at the upscale Cantina La Piedra (7-minute walk). 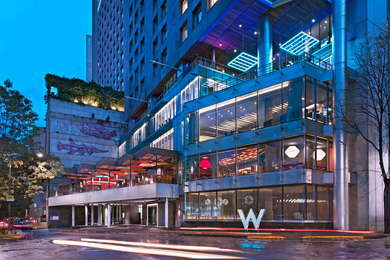 The W's hyper-modern vibe isn't for everyone, but this one takes pains to reference Mexican art and culture in a way that feels unique among W properties. Their 24-hour "Whatever/Whenever" service extends to when you're out and about and need help or tips.